★HIGH QUALITY - Durable and environmental material is very safe and suitable for kids. Crisp and smooth sound quality with adjustable volume level. Our walkie talkies are easy to carry around while resisting wear and tear to provide kids with endless entertainment! ★ULTRA LONG DISTANCE - Our Kids Walkie Talkie provides an impressive 2 miles range and 3 channels, which enables a long distance play and open a world of possibilities within your child's outdoor adventures! ★CHILD FRIENDLY DESIGN - Our Kids Walkie Talkie is small and lightweight, portable with ergonomic design for firm grip, which will fit comfortably in children's hands. A belt clip for easy attachment when not in use. Other brands do not have this safety feature! ★CRYSTAL CLEAR SOUND - No more mumbo jumbo! With a developed clear voice technology, your child's voice will be crystallized to perfection. Auto squelch function will mute the background noise so you get the crisp sound even in crowded places. Other brands do not have this CRYSTAL CLEAR SOUND! 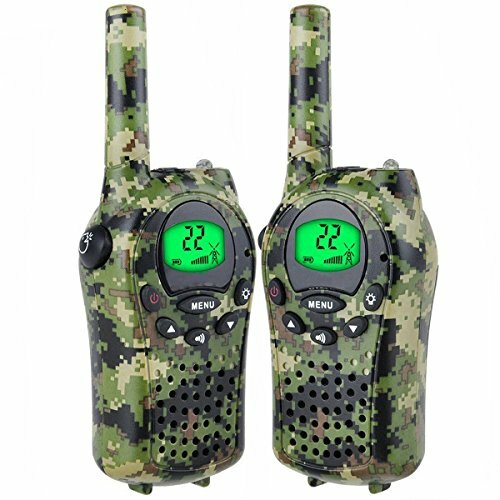 ★GIFTS IDEA FOR KIDS - Our Kids Walkie Talkie is A Prefect Gift for kids. Great playing toys as your special gifts for kids, your friends or family members. Great festivals gifts, birthday gift or visit gift and suit for any outdoor activities. Funny and amazing, You kids would definitely love it. If you have any questions about this product by TOP Gift, contact us by completing and submitting the form below. If you are looking for a specif part number, please include it with your message.